I like to share what I know; I like to help people (and I like to be seen as the expert). So it’s no surprise that I’ve written a lot of how-to posts. But relying on what I’m comfortable writing doesn’t always take the intended audience into account. And keeping the audience in mind for your content is vital, because getting it wrong can mean wasting a lot of time and attracting a lot of the wrong people. For a while, the prevailing wisdom in blogging-land seemed to center on being the expert; be useful and people will want to come to your site and read your content. And the best way to be useful? Write how-to posts. In addition, a lot of hype in the last few years centered around creating “content upgrades”: mini lead magnets created for a specific piece of content that would drive email opt-ins. Naturally, this strategy lent itself to creating worksheets and guides — and those are easiest to produce with how-to content. There was also a certain amount of advice that posts that answer specific questions (like “how to hang a picture frame”) would do well with search engines as long-tail SEO became more popular to target. All of this is still true — to some extent. But the audience for how-to posts is inherently different from the audience attracted to other kinds of posts. And they may or may not be the kind of people you want to attract. Often these people are independent, born DIYers, who like to figure things out on their own. And that’s awesome — if your ideal customer includes those people, and you have something to sell them. 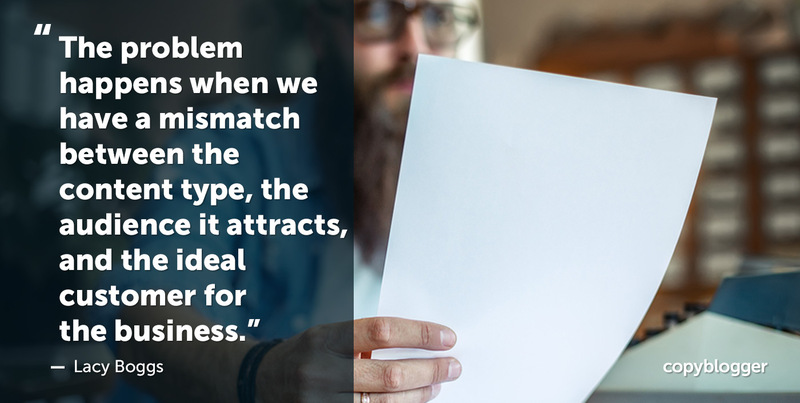 The problem happens when we have a mismatch between the content type, the audience it attracts, and the ideal customer for the business. Several years ago, when I decided to make the shift from focusing on selling products to selling services, I polled my audience to find out what percentage of the people on my email list were interested in products versus services. The vast majority of my subscribers liked the many (MANY) do-it-yourself templates, worksheets, etc. I had been providing along with my how-to content. They said they wanted similar types of products. Only one percent of the respondents said they wanted strategy or writing services from us. But the majority of what I wanted to sell — what I’ve always sold — is a service. So how did I manage to attract an audience and email list, the majority of whom were not interested in what I was selling? Pure talent, my friend. Pure. Talent. Actually, it happened because I had focused solely on the metric of growing my email leads — and the how-to posts with content upgrades did that admirably. But I hadn’t considered what kind of audience I was attracting with that sort of content. Were they interested in content marketing strategy? YES! Were they interested in hiring me to do it for them? NO. And I’m not alone in this problem. As I’ve worked with lots of small businesses over the years on their content, I’ve realized this is a super common mistake. We’ve seen the advice to write what we know, answer specific questions, etc., and so we do what comes naturally: we produce a lot of how-to content with free worksheets and downloads that are useful to drive traffic and email sign-ups. Part of the reason? How-to content comes easily for many of us. It’s a lot easier to sit down and write out step-by-step instructions on how to do a task than to craft a thoughtful essay that challenges some deeply held assumption or belief in our industry. Should you write how-to posts? The question then becomes: Who should write how-to posts — and who shouldn’t? It all comes back to finding the right match between what you want and what your ideal customer wants. How-to content absolutely has a place in the content world. I recently needed to hang two large picture frames in my house, and I didn’t know how to do it without having them rip huge holes in the drywall. So I searched for advice, and found a video — made by Lowes — about these cool devices called monkey hooks that were perfect for my needs. Armed with my new knowledge, can you guess what I did? I drove to Lowes and bought some monkey hooks. This kind of how-to content can work very well, but it mostly works for very large brands with the resources to dominate a space, or for brands in a very niche market. It’s also predicated on the idea that your customer wants to know how to do something — and that you base your sale on that knowledge. Like a home improvement store. But what if your customer doesn’t want to know how to do something? But here’s the thing: By definition, the people who want to hire an assistant to do their social media, handle their calendar, set up their email blasts, etc. don’t want to know how to do those things. They’re not going to be searching for content on how to do those things — and they’re certainly not going to hang around and download a free worksheet about how to do it. They want to know why — why they should outsource those tasks to an assistant, why they should trust a particular assistant, why she’s the expert, and why now is the time to make their lives easier. Note: An argument could be made that one might reach potential customers at an earlier stage of awareness — for example, reaching solopreneurs frustrated with setting up their business emails — and convert them to customers. But most of the how-to content I see out there simply isn’t that savvy. This isn’t to say you’re never going to write another how-to article, because that’s just not true. Rather, I want to encourage you to more carefully consider how the type of content you choose to create will help you reach your goals. Service professionals who sell very high ticket items are likely to have more luck with “why” posts instead of “how” posts. A why post provides new insight. It encourages and inspires. It paints of picture of the possible and generates desire for that new future. It also helps position the author (or brand) as an expert, with important knowledge and opinions to share. And yeah, it’s a lot harder to produce. But that may be the point. How-to content has been so overdone by now that you can Google how to do just about anything — from how to boil water to how to do brain surgery — and find a bevy of qualified sources. Standing out amidst all that has become harder and harder, especially for smaller brands. But there’s no way anyone can compete with your opinion, your “why” — it is your own, and it is unique. Sure, people might agree or disagree, but you’re the only one who can write about your opinion, your process, your philosophy, and the reasons why you are the best at what you do. And that type of content will entice the right kind of leads to your business. Finding the right type of content to meet your goals is just as important as deciding what topics to write about. It’s all part of the content ecosystem that will help you create the right content, at the right time, for the right reader to help lead them to a sale. Rather than just following a trend or writing what comes most easily (and I’ve totally been guilty of that), you must start with your goals to create a content marketing strategy that actually works, and match the type of content with the audience you want to attract. Do you write how-to content for your business? Has it attracted the right or wrong kind of audience for you? I’d love to hear some more examples of both cases in the comments below. Lacy Boggs is a content strategist, author of the bestselling Kindle ebook, "Make a Killing With Content," and the director of The Content Direction Agency. She helps personality-driven brands create and implement content marketing strategies tailor-made to support their customers and reach their goals. To learn more, go to lacyboggs.com/undercover. This is soooo true, Lacy. How-to’s are everywhere, so much so that they’re not that useful anymore. I think the next big thing will be story-driven how-to’s, like Sumo’s Growth Studies. Such articles are both interesting, as they engage you in the company’s story, and useful, as they teach you what you can do *based on what the company does*. At Foundr, where I work, I recently mix Nike’s story and what they did to become what they’re today with highly detailed how-to’s for ecommerce entrepreneurs (Shameless plug: https://foundr.com/nike-marketing-strategy/). The more personable, relatable, and realistic the how-to becomes, the better it is. As it always happens, however, it’s that they’re harder to create. I guess that’s where we’ll see who’s a real professional content writer and who’s a mediocre one. Very true! I also see case studies as being “desire” posts a lot of the time — building desire for the service rather than being how-to posts, but I get your point! I love your perspective, Lacy! Fine-tuning your marketing is all about finding the type of content that will attract and hook the right type of prospects to your business. You touched on this in the post when you mentioned the case where your ideal customer doesn’t want to know how to do something. But how-to-why hybrids here might be the perfect type of content to demonstrate that what you offer is the best choice for that person. Sort of a one-two punch showing that you know your stuff (how to) and that your approach elevates you above competitors (why). Join the club, Nancy! Haha. Glad I gave you a light blub moment. Lacy, I am not convinced. I sell a lot of how-to courses, some of them relatively expensive. Many times I’ve landed great clients from these courses because halfway through the course, they realize that what they’re learning how to do would take too much time or the wrong kind of energy for them to do it themselves. They would not have known that without taking the course, however. They have told me as much. I suspect the same kind of dynamic goes on with free how-to content. People do not divide neatly into those who would hire help and those who would not. For example, I do a lot of maintenance things around the house by myself, but I also often hire people to fix or maintain things, and I don’t always know which category a task goes into until I learn more about it. Ditto for web-related tasks. And if I did definitely want to hire someone to do something, I am not sure why I would be persuaded by their opinions, their process or their philosophy, or even want to read such content. One reason I liked this post so much is that Lacy doesn’t say “never write how-to,” but argues that we need to think carefully about it and structure it mindfully. While we write plenty of How-To at Copyblogger (and then sell relevant courses that take that into more depth, as well as offering done-for-you services with our services division), I think it’s something every content creator should think about: Is this piece of content strategically leading a prospect in a direction, or is it just something I’m publishing today because I need content and How-To seems popular. I’m also not sure you can necessarily perfectly compare customers for a course, who have “skin in the game,” with readers of free material on a blog, who don’t. I suspect the investment in the course could even make them even more inclined to hire someone to get the result they were originally looking for. You have so much background, Marcia, that I suspect you direct your content strategically by instinct at this point. But it’s a common point of failure for a lot of writing content that I see that’s intended to build freelance businesses. Sonia, You make some good points. I agree that thoughtlessly creating how-to content is unlikely to be effective. My main point, however, was that people don’t divide neatly into “want to hire someone” and “want to do it myself.” Many people educate themselves about a task before deciding whether to hire someone or do it themselves. Your how-to article can bring them to you and help them make that decision. It can also attract some “want to do it myself” people who have a light bulb go off from your how-to article, so that they realize it would be dangerous, wasteful or counterproductive for them to do it themselves. You’re right in front of them at that point. In addition, I agree with Ivan Kreimer’s point above that “The more personable, relatable, and realistic the how-to becomes, the better it is.” It’s actually quite difficult to write high-quality how-to material that has a distinctive voice, the right level of detail and an air of well-earned authority. But those who can do that will experience a payoff from it, regardless of the extent of the apparent competition. It’s actually quite difficult to write high-quality how-to material that has a distinctive voice, the right level of detail and an air of well-earned authority. But those who can do that will experience a payoff from it, regardless of the extent of the apparent competition. I had some success with that back in the day. I agree that it can be done that way, Marcia, but as I note in the article, many business owners I work with anyway aren’t thinking that far ahead or deeply. They aren’t creating their how-to content with the aim of converting the frustrated to their service, they’re simply trying to be helpful — and in so doing are attracting a lot of the wrong readers, even if they get a few of the right ones. I started catching on to this same concept on Twitter. As I began connecting more with fellow financial bloggers, website engagement started to drop. The problem I was trying to sell the same thing my Twitter audience was trying to sell. I had to step back and refigure my content and my audience. It’s an ongoing process, but awareness of the problem is the first hurdle. The best thing I ever did is to stop listening to the mass of advise and only listen to people who advise makes sense. Thanks Kevin! It sounds like you’re saying you were preaching to the choir on Twitter, so to speak, instead of engaging with potential customers? Great article, Lacy! In my industry (I am a freelance translator) this is one of the most common mistakes we tend to make. We literally provide thousands of How-To posts over the internet and then we end up wondering what went wrong and we have lots of likes and shares from colleagues but not even one lead. Your ideas are truly valuable and this content gives us a lot to think about in order to make our business grow. Thanks! My pleasure! Glad it is helpful.